In a bid to give back to the music Industry, Young Music producer Eazibitz "eazi ooo" is proud to announce an exciting contest for all talented artistes across the Federation. 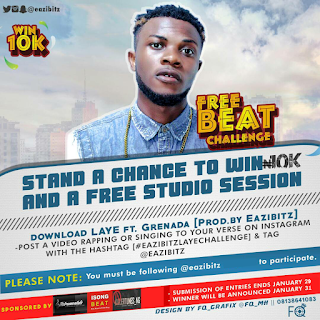 The LAYE free beat has open verses; both singers and rappers are eligible to participate. The Winner of the #eazibitzlayechallenge will be given a rare opportunity to work alongside Eazibitz in a free studio session including a cash prize of #10,000. Submissions End January 29 2018. Winner will be announced January 31 2018. Follow @eazibitz @grenadabadman on Instagram/Twitter for all #eazibitzlayechallenge Updates.